What’s in a name? 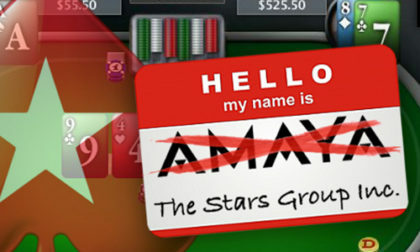 A few weeks ago, executives at PokerStars parent Amaya Inc. announced that a name change was in the works. The curtain’s been opened, and the new corporate name didn’t surprise anyone at all: Once the I’s are dotted and the T’s are crossed, the firm shall be known as The Stars Group, Inc.
As we conjectured a few weeks back, when news of the impending name change first surfaced, the high probability all along was that the “Stars” brand recognition with consumers would be far too valuable to jettison. Amaya’s been headed down that road anyway, as with the firm’s flagship sports-betting product, BetStars, and the company’s new daily fantasy sports offering, StarsDraft. Add in the fact that the Amaya corporate name has been tied to many controversial happenings over the past couple of years, and it’s easy to see why the old corporate name was easy to jettison… even if you won’t read about that part of it in any of the firm’s official pronouncements. As for the first-quarter results for Amaya, the company posted solid growth, year over year, even though virtually all of that growth came from markets other than poker. Amaya’s overall growth over the past year was almost exactly 10%, though its online poker revenue for 2017 Q1 was $218.1 million, up only 1.1% from 2016 Q1. Though poker is still king at Amaya, someone’s sawing a few centimeters off the legs of the throne. In 2016’s Q1, online poker accounted for 75.0% of Amaya’s revenue. In the most recent quarter, that figure dropped to 68.9%. Assuming something close to straight-line transition — and continuing presence to convert its core poker-playing customer base into multi-service gambling customers — it shouldn’t be long past 2020 when the rebranded Stars Group can claim most of its revenue comes from streams other than online poker. Moving on. Little information is provided about the planned move to Ontario except the note that it won’t happen until the company’s new chief financial officer is installed. Current CFO Daniel Sebag announced his indefinite retirement plans back in January, and viewed from the “fresh start” perspective, it’s likely a good thing. Sebag has long been a close friend and associate of ousted Amaya CEO David Baazov, and all parties involved likely realize that it’s a good time for Sebag and the company to part ways. Thus the holding pattern continues. Amaya, errm, The Stars Group did announce the hiring of a new chief corporate development officer. This new position will be manned by former William Hill exec Robin Chhabra, and he will begin his new duties in September.